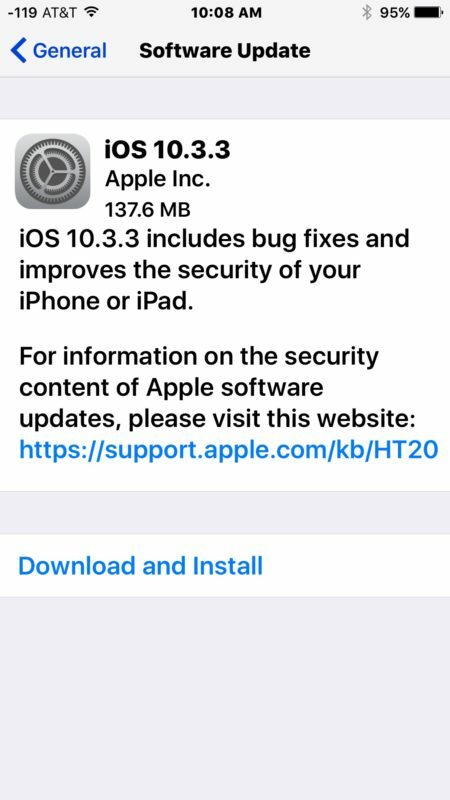 Apple has released the final version of iOS 10.3.3 for iPhone, iPad, and iPod touch. The update is said to include bug fixes and security enhancements for iOS, and no new features are included in the software update. Links to download iOS 10.3.3 IPSW are included below, though the majority of users are best served by installing iOS 10.3.3 through the Software Update feature or from iTunes. The easiest way to update to iOS 10.3.3 is through the Software Update mechanism of iOS. Always backup an iPhone or iPad before installing any software update, even if is a minor point release update. 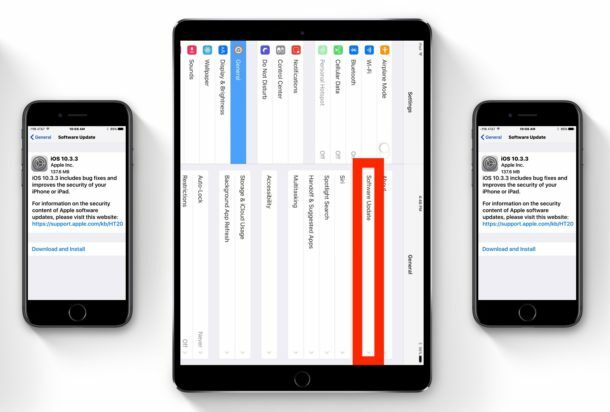 The iPhone or iPad will automatically download and install the update, which is fairly small, and then reboot when the update has been completed. Users can also choose to install iOS 10.3.3 through iTunes and a computer, or by using IPSW firmware files to manually update. IPSW links point directly to firmware files on Apple servers. Be sure to save the firmware file with a .ipsw file extension, for best results right-click on an IPSW download link and choose “Save As” to prevent the file saving incorrectly as a zip. Using IPSW is considered more advanced, but is not particularly difficult. Just be sure to download the proper firmware file for your device. iOS 10.3.3 is separate from iOS 11, the latter of which is currently in ongoing beta and due for public release this fall. Separately, Apple has also released macOS Sierra 10.12.6 for Mac users, watchOS 3.2.3 for Apple Watch, and tvOS 10.2.2 for Apple TV. What’s the advantage of using an IPSW file for a clean iOS install over selecting “Restore” in iTunes? To me it seems there shouldn’t be a difference, yet I see this method being recommended on several websites. @MDT – Yes – My iphone 6 same issue, crashing and random restarts. It’s an issue with the battery, apple store will replace for free – in the uk. Websites for downloading ipsw file will not open. My iphone 6 crashing and random restarts. and on off button doesn’t work, i try to downgrade on off button can work as well. but now i try updated ios 11 still same problem. Can’t apple realease another software update that will fix the rapid battery drainage issue? I think it’s the best thing to do. I was directed to this site to downgrade from iOS 11. I decided to downgrade because the mail and message apps were worse in the new version. I connected my phone to a windows iTunes computer and could only restore – not update – the phone back to iOS 10.3.3. I lost all my data but could gain some back from the last iOS 10.3.3 backup it recognized on my iCloud account. I couldn’t use the iOS 11 backup created after the iOS 11.1 update. The phone seems to work as it did before but the background I had with the iOS 10 version is different now and doesn’t seem to be available in the display settings. This makes me suspicious about whether I have a true apple iOS version installed and I’m wondering if my phone is secure. Only iOS IPSW files from Apple can be verified by Apple servers and installed onto an iPhone or iPad. In other words, as long as the IPSW you downloaded came from an Apple server, and was installed onto the device (they can only be installed as they are being signed by Apple, it is a verification process), then yes you are on a “true” Apple iOS release. The links to firmware here are to Apple servers, you can verify the URL by hovering over and you will see the Apple CDN server url with apple.com as the root domain. Hope that helps. But yes you are correct, iOS 11 backups can not be used to restore to an iOS 10.3.3 device, so you must have an iOS 10.3.3 backup to use after a downgrade. Otherwise, you’d have to update back to iOS 11 again. Eventually iOS 11 or newer will be all that is signed by Apple, which then makes downgrading impossible. Hi, is anybody experiencing the issue of Error 3194, Error 17, or ‘This device isn‘t eligible for the requested build‘? I’ve checked their site https://support.apple.com/en-us/HT201442, and have checked that both of the hosts file and internet connection are okay and I’m not using any filtering/firewall/security software. If anybody knows the solution for this problem, would you kindly share how? yep happened to me too. Tryign to fix an iphone 6s plus and got no luck cause ios 10.3.3 is no longer signed! Ideas, anyone? When I select and start download the iOS 10 for my phone, 5s, in my downloads on the desktop it says it’s for iPhone 4. Why is that? Anybody knows? How do you downgrade iOS 11.1 to iOS 10.3.3 on an iPhone 8? If I’ve downloaded 10.3.3 while apple was still signing it will it work after they stop signing it? No, Apple has to sign the IPSW version for it to restore. It uses an internet connection to verify signing. Getting this message: The iPhone “” could not be updated. Declined to authorize this image on this device for this user. TIM COOK NEEDS TO BE FIRED. Then I’d consider coming back to Apple. In all honesty, the only thing I’d buy now from Apple is the iMac. Thank you again, apple, for nothing. Thank you for fixing a problem we didn’t have.